Our difference comes from a shared vision – teachers, children and parents – to make learning dynamic and exciting, to embrace opportunities, and never to be fearful of trying something new. We may be small in size but we are always big in ambition. Every child knows each other and every member of staff, so the younger children feel safe and secure, the older children develop a keen sense of responsibility and all children feel valued and loved. We have a Head Boy and a Head Girl who are our school ambassadors. Elected by the whole school they represent us at events, give speeches at school and tour visitors. Every Year group has two representatives on the school council who meet every fortnight to discuss hot topics, put forward any concerns to a member of staff and recommend new initiatives. Being on the School Council also helps develop the children’s presentation and negotiation skills, as well as helping them to understand how and why decisions are made. 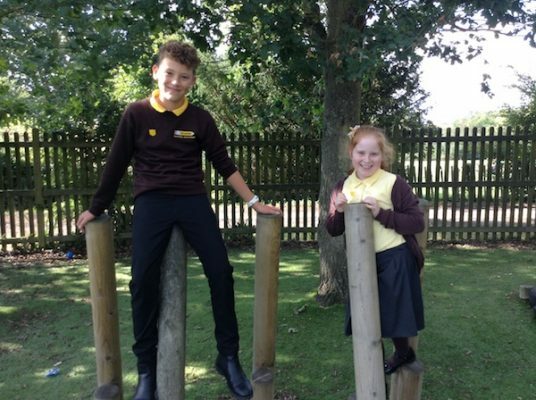 One of the many highlights of being in Year 6 is being a buddy to a Foundation Stage child – through out that first year the Year 6 child is a role model, helps their buddy settle into school, looks after them at lunch and reads with them weekly. It is lovely to see both children blossom in confidence as the year progresses. All our parents are members of FORS and are encouraged to get involved. FORS organises amazing events that enrich learning and raise money at the same time (double joy) such as Woodland Day and Winter Wonderland, as well as arranging our much loved and eagerly anticipated New Intake Picnic, Halloween Disco and Dragon Boat racing. Over the last 4 years FORS has raised £22,000 and, among other things, has funded the refurbishment of the school pool. Our wonderful Chair is Fran Clifford, supported by our equally fabulous Charlotte Coggins (secretary) and Joe Lee (treasurer). Please don’t hesitate to ask Fran, Charlotte or Joe about how to get involved. Look out for FORS next meeting date in the newsletter. Or join FORS on Facebook. And please don’t be shy – we can never ever have too many volunteers! Without our parents the difference we make would be greatly diminished. Our wonderfully supportive parents are one of the reasons our school is so special. Parental support at home is invaluable. Please ask the class teachers to find out more about how you can help enhance your children’s learning at home. There is lots of research that demonstrates the positive link between help at home and a child’s attainment. Parental involvement at school enriches school life and learning and enables our school budgets to stretch much, much further! Parents help in a myriad of ways, for example, a parent who is a journalist came to talk to our children about the power of the word and what it’s like to work in newspapers; another parent organised for a distant relative of a War Horse to visit the school to discuss the invaluable role horses played during WW1! Other parents have lent us super cool tents, do amazing make-up for the school plays, give guitar lessons, run gardening activities and craft clubs. Please just ask in the office how you can help or email suggestions here. We are extremely lucky being in the heart of such a friendly and supportive community. Rolvenden and Rolvenden Layne inhabitants are willing participants in our many cunning plans. You’ll often spot a welly-clad Rolvenden pupil purposefully striding through the village to purchase some vital cookery class ingredients in Ken’s shop, or studiously studying the wildlife in a garden or the neighbouring field. Calendar highlights include Harvest Festival in the church, carol singing in the farmers market, submissions for the annual flower and produce show, participation in local fetes and sponsored walks. We are also part of the Tenterden Rural Alliance – a collaboration of 13 local schools (primary and secondary) focussed on delivering an exceptional, world class education for all.